Gibson, who had recorded four urban folk albums in the second half of the '50's (compiled in the excellent CD Joy, Joy The Young And Wonderful Bob Gibson, Riverside, 1996), co-wrote the song "What You Gonna Do" for his Where I'm Bound album (Elektra 1964) with Neil, his last album before a self imposed hiatus. In 1961, Gibson had formed a duo with Hamilton Camp. The latter's landmark album was Paths Of Victory (Elektra, 1964) that would include a bunch of Dylan covers with double-tracked voice and trendy tunes. It seems that Camp had also jammed at Chip Monk's with Neil and Fred, where he could learn some Dylan's unknown pieces, that he would record for that album. In 1961, Bob Gibson, who would support and promote many up and coming talents like Joan Baez, Judy Collins and Phil Ochs, created New Concept, his own management office, that tried to book himself "and some other folkies in some of the places available. We had an incredible roster of people, Freddie Neil, David Crosby, Bobby Dylan, Richie Havens and several others, nearly whom went on to do great work." 21 Dylan, after landing a record deal with Columbia in 1962, signed with another Chicago native, who had moved to New York, Albert Grossman, who had first managed artists like Odetta and Gibson himself. Meanwhile, Bob Gibson presented Neil in Chicago and Toronto. In Hollywood, Camp, Gibson and Neil did a series of folk music radio programs. Gibson would maintain his close friendship with Fred, helping in the mixing of his last official release, the Other side of this Life album in 1971. It was not long before hard drugs appeared on the scene and began to take their toll on both music and musician. Valente was busted and spent time behind bars in the late sixties, preventing his career from taking off. Neil also battled drugs, making him someone that industry would shy away from embracing, to quote Jac Holzman, the man who gave Fred his first recording contract: "listening to 'Blues on the Ceiling you could almost forgive him his irresponsibility as a human being.' 23 His tenure at Elektra would be short lived. Soon, drugs and the pressure to succeed caused many to retreat. Karen Dalton would flee to the country, mostly Boulder (Colorado) and Woodstock. Both Neil and Tim Hardin would also spend considerable time in Woodstock, attempting to escape the pressures of city life. He also was innately suspicious of anything that even hinted at commerciality. "He's a good friend of Lenny Bruce's, and of these jazz musicians," said John Sebastian,"and they equated commercialism with some kind of selling out. With some kind of a denigration of what they did. And so this kind of selling out was something that Fred was very afraid of." 26 Fred in fact, was friendly with Bruce, doing a show with him at The Gate of Horn in Chicago, in December 1962, a show that would end up with Bruce being arrested on obscenity charges. Neil admired Lenny Bruce and became a close friend of the embattled comedian, according Howard Solomon and Sam Hood, both Village club owners friendly with both artists. Another artist who opened shows for Bruce was Judy Henske who did the honors when Lenny played the Unicorn in Los Angeles. Henske was a terrific blues singer who had been a member of the Whiskeyhill Singers, who when in New York would regularly open for another up-and-coming comedian, Woody Allen. Henske's manager was Herbie Cohen, owner of the Unicorn in L.A., where Bruce performed and would eventually be arrested. Cohen soon branched into managing some of the acts that performed at his club, like Frank Zappa, Wild Man Fischer, Captain Beefheart, Tim Buckley, and for a time, Fred Neil. It was Cohen who hooked up Neil with Nik Venet at Capitol, soon after Fred left Elektra. His freelance executive presence in recordings of Henske, Neil and Buckley, would bring back impressive line-ups, including musicians like stand-up bass player Jimmy Bond, Jr., guitarist John T. Forsha and drummer Billy Mundi. Unfortunately, few of these artists would achieve commercial success. Valente recorded only one poor selling solo record before joining Quicksilver Messenger Service, reinventing himself as a rocker. Karen Dalton recorded two albums and disappeared. Martin did the same, his last record coming out in 1973. Hardin, would continue to record, off and on, until his drug related death in 1980. Henske would not release an album for more than thirty years. 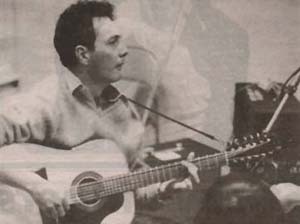 Fred Neil went south to Coconut Grove, Florida, where he retired from the music business, living off the royalties generated by his songs, especially "Everybody's Talkin'." In hindsight, these musicians were not really folksingers, their styles being too diverse and influenced by too many musical strands to be labelled simply as 'folk music.' On one hand, they were influential among their fellow musicians, seen as trailblazers of a new era, where all different types of music would play off each other, but on the other hand, they became difficult for record labels to be able to pigeonhole, simply not knowing what to do with such innovative sounds. Record companies at the time were looking for the next Kingston Trio. It was not until a handful of small labels, led by Elektra, Vanguard and Verve/Folkways, began to take chances signing the more eclectic 'folksingers' that artists like Fred Neil and Dino Valente were afforded the opportunity to record. Fred Neil, Dino Valente and Karen Dalton were a different breed of folksingers, more musically inclined than the topical songwriter-artist of the day, in a way they were well ahead of their time. Recommended listening: Sessions (Capitol, 1967) by Neil, Dino Valente (Columbia, 1968) eponymus album by himself, It's So Hard To Tell You Who's Going To Love You Best (Capitol, 1969) by Karen Dalton or If Jasmine Don't Get You The Bay Breeze Will (Capitol, 1969) by Vince Martin. In 1962, Fred followed Vince Martin to South Florida, giving birth the Coconut Grove folk scene. David Crosby, Mama Cash Elliott, Lisa Kindred, Buzzy Linhart and others would soon follow would create a vibrant folk-blues-jazz scene attached to that special Southeast jasmine breeze. Then, Neil would record his first album: an under-rated duet with Vince Martin titled Tear Down The Walls (Elektra, 1964) that exhibited strong American roots influences. Bleecker & MacDougal (Elektra, 1965) followed, his first full-length masterwork full of galloping folk-blues and master balladry, showing raga influences. By then, he was only playing New York sporadically, mostly at the Nite Owl Café and the Café au Go Go, moving to Los Angeles after signing with Capitol records. During this time, Neil would be backed sometimes by The Seventh Sons, the Buzzy Linhart acoustic-excursionist band. Richie Havens and Buzzy Linhart, among others, also would play the same venues and gigs and would make popular this new kind of progressive folk style -also preferred by Sandy Bull, John Fahey and Richard Fariña- that was already light years from traditional patterns. The end of the decade was maybe his best recording period ever. Although based in Coconut Grove in Miami -where he really fell in love forever with dolphins- Neil would record for Capitol Records his three last albums (Fred Neil, Sessions, Other Side Of This Life) with Nik Venet at the controls. Much unreleased material from the Capitol period remains, disgracefully, in the vaults. He rarely performed live, save for the odd set in California, Woodstock or Miami. In 1968 Fred Neil would disappear of sight, settling for a time in Woodstock, returning permanently to the Grove by the early seventies, where he would devote much of his time to these dolphins, working closely with the Dolphin Project, which he founded with his friend Ric O'Barry.